The Volkswagen Golf Alltrack is an all-new model that was introduced into the Golf family and though rather comparable in design to the Volkswagen Golf SportWagen, the new Alltrack offers customers an off-road capable wagon with increased ground clearance, standard all-wheel drive and a fun-to-drive performance base. The all-new 2017 VW Golf Alltrack adds to the already well-rounded Golf family but don't let the wagon body style fool you because the Golf Alltrack is up there with the best of the off-road capable cars. The 2017 VW Golf Alltrack is available in three trim levels S, SE and SEL. All models come standard with 4MOTION all-wheel drive system which helps provide reliable traction and optimum directional stability. The all-wheel drive system can automatically adapt to varying road conditions with ideal power delivery. Along with having an off-road mode, the 2017 Golf Alltrack offers an available Off-Road Monitor that has a customizable, digital 3-gauge monitor that lets the driver keep a close eye on off-road functions such as altitude, steering wheel angle, compass and much more. All 2017 VW Golf Alltrack models are powered by a 1.8-liter turbocharged engine that produces 170 horsepower and can still get an estimated 22 city mpg and 30 highway mpg. Everything about the Golf Alltrack screams off-road ready. Aside from the powerful engine, all-wheel drive and off-road system the Golf Alltrack features increased ground clearance and rugged bumpers built to help protect against tough road conditions. But with features such as Apple CarPlay, Android Auto, a panoramic sunroof, leather seats and available active safety features, Volkswagen makes sure that the 2017 Golf Alltrack is equipped with everything to make this a stylish, affordable, practical and fun wagon. 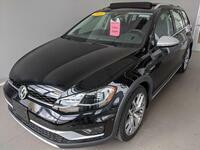 The 2017 Volkswagen Golf Alltrack is available now at Hall Volkswagen in Brookfield, WI. Come see us in person to test drive the all-new Alltrack or give us a call today to talk with a sales team member. We are a quick drive from Milwaukee, Waukesha and the surrounding areas so let us be your go to Volkswagen dealer in the Brookfield and surrounding area.